Donald Trump’s decision to withdraw all 2,000 American troops from eastern Syria has provoked a scramble for advantage by Russia, Turkey and Syria. It has decisively changed the balance of power in the region – with the big losers being the Kurds and the West. Has the American president now given carte blanche to Moscow to become the dominant power in the Middle East? Does it signal an American retreat from the world’s trouble spots and the start of an isolationist, go-it-alone US foreign policy? The first big casualty of the Trump’s decision, announced last month, was Jim Mattis, the US secretary of defence, who was appalled by what he saw as a hasty move and quit. Shortly afterwards, Brett McGurk, the American special envoy to the global coalition fighting Islamic State militants, also resigned, throwing into turmoil Western attempts to stop a resurgence of Islamist extremism and help to frame a peaceful settlement of the Syrian civil war. President Trump has since announced that the pull-out of forces might be delayed a little. But no one doubts his determination to bring the soldiers home, or his belief that America has no further interest in a region that has cost the US thousands of casualties over the past 20 years. When the US troops leave, the small British and French units, part of the coalition that defeated Islamic State fighters on the ground and ended the so-called Islamic caliphate, may also soon be quietly withdrawn. Britain announced that it remains committed to its obligations to its Kurdish allies and to preventing any regrouping of the defeated fighters. But there is no illusion in London that the small British force, a fraction of the US contingent, can hold the line or deter an attack by Turkey on the Syrian Democratic Forces, largely comprising YPG Kurdish militias. President Erdogan says this group is linked to the Turkish PKK separatists, and has vowed to clear all of them from Turkey’s southern border. Within days of Trump’s announcement, Turkey sent its tanks to surround Manbij, a strategic town in northern Syria that has been a base for the US troops. As long as the Americans were there, Turkey hesitated to attack militias who are closely allied to the Americans. The Kurds were armed by the US and have done the bulk of the fighting against Isis. They now feel betrayed by Washington. They immediately appealed to President Assad to protect them against the threatened Turkish attack, and Syrian forces then moved up to the suburbs of Manbij for the first time in six years. It looks like the end game in the Syrian imbroglio. It leaves Assad in brutal command of almost all his country, with the Russians and his Iranian allies firmly entrenched to help him “mop up” his remaining opponents. Turkey, no longer fearing a clash with its US Nato ally, looks poised to strike hard against the Kurdish militias. Russia, no longer needing to worry that its airstrikes might bring it into conflict with US fighter jets in the region, now has a free hand to help Assad wipe out the last safe haven for Syrian rebels, pushed into a neutral enclave in north-west Syria next to the Turkish border. Turkey now finds itself in a pivotal position. Erdogan has the forces and the determination to “cleanse” his border region of Kurdish “terrorists” – a useful political boost to his popularity at home in the run-up to local elections in Turkey in March. But in marching into Manbij, he risks a direct clash with the Assad government. As one of the three sponsors of the Syrian peace talks being held in Astana, the capital of Kazakhstan, together with Russia and Iran, he will be wary of a direct confrontation with the Syrian army and its Russian backers. But he need no longer worry about American opposition to such a move: Trump has washed his hands of the whole Syrian civil war. 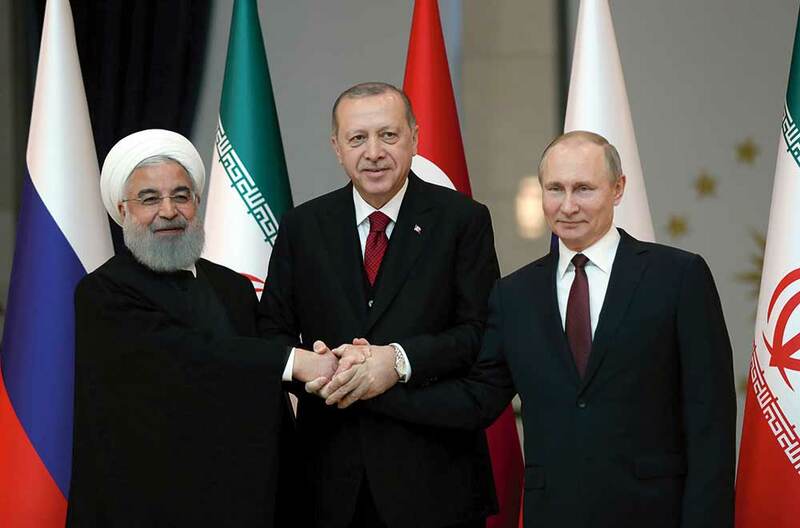 To ensure a satisfactory division of the spoils, a Turkish delegation flew to Moscow to finesse Moscow’s offer to mediate between Damascus and the Syrian Kurds in the northeast. Almost certainly, the Kurds will now be forced to withdraw all along Turkey’s southern border. The immediate danger is that this will allow many of the Isis fighters, captured by the Kurds and held in prisons guarded by the Kurdish militias, will be allowed to go free. With their Kurdish captors gone, there will be no one left with any interest in keeping them in jail. The Islamist fighters will be able to slip back into their villages and plot either a new military assault to restore their former caliphate, or, more likely, regroup as an underground terrorist force, ready to infiltrate the west – where many of the fighters came from – and plot terrorist actions across Europe and the Middle East. The Russians now have what they want. President Assad is firmly back in charge. Indeed, this has been recognised by his Arab neighbours, which, one by one, have been sending their ambassadors back to Damascus and preparing to resume normal diplomatic relations with Damascus. Moscow now sees no threat to its important naval base at Tartus, on the Mediterranean, or any further challenge to Assad’s alliance with Russia. The Syrian leader is utterly dependent on the Russians’ support and on their weapons, and the other powers and leaders in the Middle East are acknowledging Moscow’s dominant role in the region. Iran, too, need not worry in future about international pressure to withdraw its brigades from Syria – even if many Iranians at home want their government to bring back their troops and cut the huge expense of supporting Assad. Trump’s decision, instead of underlining the isolation of Iran, has played straight into Tehran’s hands. A collapse of the multinational force on the Syrian-Iraqi border that was largely staffed by the Americans would essentially cede control of all Syria to Assad. It would leave the West with no say in any final political settlement or any way to limit Iranian influence in the country. In announcing that he was taking US forces out of Syria, Trump claimed that the job was done: Isis was beaten and the US should not be wasting money on further operations. But Isis is far from beaten, as the Europeans and many fearful Arab governments know. It has simply been driven underground. The West has few options left, however. Last week Jeremy Hunt, the British foreign secretary, admitted that Assad was likely to remain in power for the foreseeable future. In effect, he announced that Britain had given up all attempts to force him to leave office. Similar decisions, based on “realpolitik”, are likely to be taken in Paris and other European Union capitals. And the Europeans may also now be looking at the chances to take part in the massive rebuilding of the country that Assad has reduced to ruins. They may also be hoping that many of the refugees, resigned to living under an Assad-Russian regime, will now quietly return home. The West may hope to breathe new life into the moribund Geneva peace talks. But Assad now holds all the cards, and has no interest in any compromise. In any case, the only talks going on are those in Astana, which will simply ratify Assad’s victory. It looks as though any peace will come on Russian and Iranian terms. Is that really what Trump intended when announcing his pullout?